Being one of the Children's Church teachers is something I truly enjoy. The children are all so excited to hear stories about Jesus and to really learn about Him. They are open to everything and they believe without the "seeing" that is required by so many adults. We are often looking for other stories to read to our kids after our Bible study is complete. 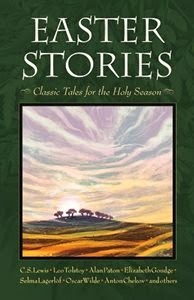 I was thrilled when I received Easter Stories: Classic Tales for the Holy Season to review. This book is filled with 383 pages of delightful Easter stories that adults and children alike will enjoy. The stories are written by lots of different authors including Oscar Wilde, Leo Tolstoy and CS Lewis, to name a few. The children enjoyed hearing the different stories and they fell in love with one in particular. The Selfish Giant by Oscar Wilde was a huge hit! They loved how the children changed the heart of the Giant and at the end of the story, they loved how Jesus was incorporated into it. (You must read it to find out what I'm talking about) The stories held the interest of the kids and I have had several parents ask me where they could buy the book. We highly recommend this book to everyone. It will be a wonderful addition to your home library. Would you like a chance to win a copy of this book for yourself? Simply enter on the rafflecopter form below and you could be that winner!